Toes tap, feel good fun. We are greatly indebted to our friends and neighbours Chris and John for all their help in getting to know the area in a way we cannot, not living there full time (yet). They have helped us sign up with the local council to pay our garbage tax for refuse collection and provided much useful local knowledge. Key amongst this vital info is the existence of the Colavecchia cantina (just past Putignano and follow signs for Gioia del Colle). 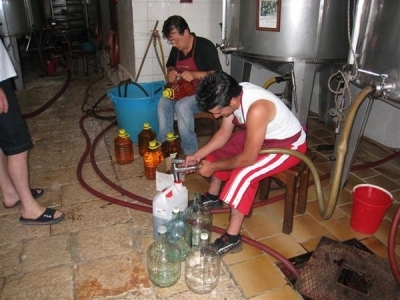 They make typical local wines and keep their overheads low by not bothering with bottling the stuff. Take along your own demi-john or 10 litre container(s) and get it filled direct from the tank! Tasting direct from the "petrol pump"
Not only is it very quaffable wine - well made, gobs of fruit and a belter of a wine at 14 % - it cost a staggering EUR 1.10 a litre!! That is GBP 0.65 (USD 0.33) per bottle. So we bought 5 litres and bottled it ourselves when we got back to Trullo Azzurro.